Expedition 40 Commander Steve Swanson, of NASA, rests in a chair outside the Soyuz Capsule just minutes after he and Flight Engineers Alexander Skvortsov and Oleg Artemyev, of the Russian Federal Space Agency, landed in their Soyuz TMA-12M capsule in a remote area near the town of Zhezkazgan, Kazakhstan, on Sept. 11. Swanson, Skvortsov and Artemyev returned to Earth after more than five months on the International Space Station, where they served as members of the Expedition 39 and 40 crews. Steamboat Springs — There can’t be too many other people here on Earth who are enjoying sipping beers, spending time with family and sitting down to watch football games as much as Steve Swanson is right now. On Sept. 11, Swanson roared back to Earth in a space capsule and landed in the plains of Kazakhstan at the end of a very memorable 169-day mission to space. His beaming smile said it all. In those first moments back on Earth, the commander of Expedition 40 had a lot to smile about. He said his crew did more science up on the station than they originally had anticipated. And between science experiments and a space walk on the Space Station, Swanson found plenty of time to give people here in his hometown several tastes of space with constant pictures, videos and communications back home. Swanson on Tuesday reflected on his accomplishments and what it’s like to be back on Earth. What do you think was your biggest accomplishment in space? Having stayed up in space for almost half a year, Swanson’s mission also will give NASA a better understanding of the long-term impact of space travel on humans. Upon arrival home, he started undergoing a range of tests that continue today to measure the physical impact of space. What were your most memorable days on the Space Station? Swanson also mentioned several science experiments and maintenance jobs on the Space Station as highlights. He stayed plenty busy, doing such things as an interview with Colorado State University students and running part of the Wild West Relay from Fort Collins to Steamboat. What’s it like being able to bring Steamboat memorabilia to the Space Station and represent your hometown up there? What was the difference between your first two space shuttle missions and this longer mission? “On the shuttle missions, we were much busier because we were only up there for two weeks,” Swanson said. He said the shuttle missions also had more of a single focus, like installing solar arrays on the Space Station. There was a lot of tension between the United States and Russia while you were up there. Was that ever a factor on the mission? 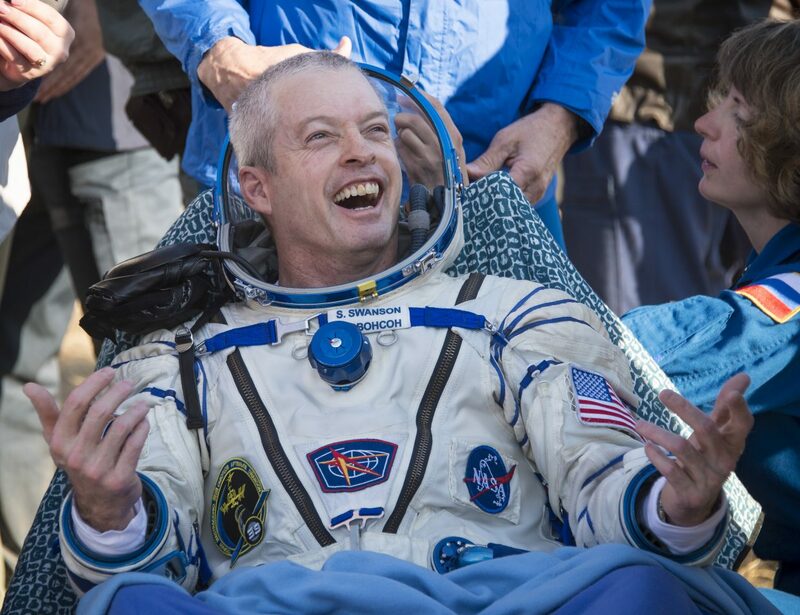 “We all miss some parts of being up there in space, but right now, I’m feeling great,” Swanson said. Swanson mentioned spending time with family, the beer and football games as things he’s really appreciating about life back on Earth in the weeks after his return. What did you choose for that first meal upon your return? “Bangers and mash,” Swanson said. Upon landing on Earth, Swanson still had a lot of flying to do to get back to his home in Houston. He said he ate that first post-mission meal during a refueling stop in Scotland. On a second stop in Maine, it was pizza.